As the shutdown drags on into its 27th day, lawmakers are attempting to alleviate some of the financial pain felt by affected federal employees. 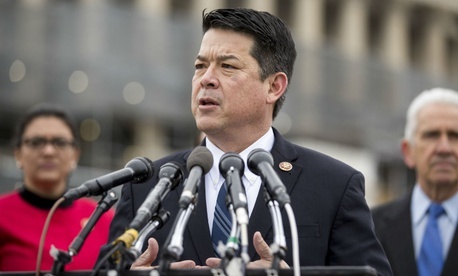 A bill introduced by newly-elected Rep. TJ Cox, D-Calif., on Thursday would offer employees at shuttered agencies a no-interest loan of up to $6,000 to help pay mortgages and cover bills for other necessities. A credit check would not be necessary in order to qualify, and the amount of the loan would be automatically deducted from the recipient’s paycheck once government reopens. Excepted employees working during the shutdown have always been guaranteed compensation once the appropriations lapse is resolved, and a bill President Trump signed into law on Wednesday extends that guarantee to furloughed employees as well. The bill, which had 70 Democratic co-sponsors as of Thursday morning, would extend the same loan option to employees in any future shutdown lasting more than 15 consecutive days. Co-sponsors joining Cox at the podium Thursday emphasized that the bill would not provide federal employees any money they are not already owed, but would go a long way toward alleviating financial stress during the shutdown. Providing loans is the right thing to do, she said. “I know that $6,000 is going to help … our families on a temporary basis,” she added. Meanwhile, other lawmakers are attempting to get excepted employees paid now, rather than when government reopens. Republican Sens. Ron Johnson, Wis., and Susan Collins, Maine, last week unveiled the Shutdown Fairness Act, which would grant immediate pay to employees working during the shutdown because their jobs involve the “safety of human life or protection of property.” Agencies would be authorized to use unappropriated funds to compensate excepted personnel now. The lawmakers compared the bill to the 2013 Pay Our Military Act, passed before the October 2013 shutdown. That act gave the Defense Department flexibility to keep most civilian workers on the job during the lapse in appropriations and to pay the armed services and any civilians and contractors working in support of the military on time. Meanwhile, the House on Thursday rejected a Republican attempt to give federal employees the first paycheck they missed during the partial shutdown. The legislative language would have retroactively funded agencies through Jan. 15, thus allowing money for the paycheck but continuing the shutdown.